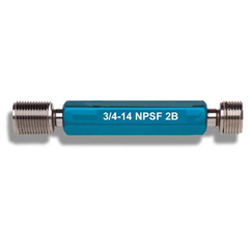 NPSF straight pipe thread plug gages are manufactured per ANSI /ASME B1.20.3 are used to inspect NPSF internal threads. This type of thread is straight instead of tapered and internal only.. The NPSF thread is considered more economical to produce than tapered internal threads, but when assembled do not offer a guarantee of sealing since root and crest interference will not occur for all threads. NPSF threads are generally used with soft or ductile materials which will conform at assembly to the taper of the external threads. They can also be used in applications with thick brittle material as well. They are primarily intended for assembly with NPTF external threads. NPSF external threads and gages are not available. Thread Check offers gages for a complete range for hose coupling screw threads covered under ASME B1.20.7. 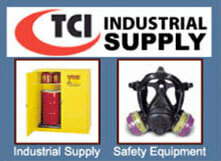 Other straight pipe thread gages include NPSC, NPSL, NPSI, NPSH, and NH sizes. 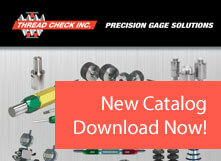 Thread Check’s expert sales engineers can assist you with selecting the correct gages for your application. NPSF-1/16-27-PG-GO 1/16 - 27 NPSF Go Thread Plug Gage .0625" 1/16 27 .2768" .2803"
NPSF-1/16-27-PG-NGO 1/16 - 27 NPSF No Go Thread Plug Gage .0625" 1/16 27 .2768" .2803"
NPSF-1/16-27-PG-D/E 1/16 - 27 NPSF Go/No Go Thread Plug Gage w/handle .0625" 1/16 27 .2768" .2803"
NPSF-1/8-27-PG-GO 1/8 - 27 NPSF Go Thread Plug Gage .125" 1/8" 27 .3692" .3727"
NPSF-1/8-27-PG-NGO 1/8 - 27 NPSF No Go Thread Plug Gage .125" 1/8" 27 .3692" .3727"
NPSF-1/8-27-PG-D/E 1/8 - 27 NPSF Go/No Go Thread Plug Gage w/handle .125" 1/8" 27 .3692" .3727"
NPSF-1/4-18-PG-GO 1/4 - 18 NPSF Go Thread Plug Gage .250" 1/4" 18 .4852" .4904"
NPSF-1/4-18-PG-NGO 1/4 - 18 NPSF No Go Thread Plug Gage .250" 1/4" 18 .4852" .4904"
NPSF-1/4-18-PG-D/E 1/4 - 18 NPSF Go/No Go Thread Plug Gage w/handle .250" 1/4" 18 .4852" .4904"
NPSF-3/8-18-PG-GO 3/8 - 18 NPSF Go Thread Plug Gage .375" 3/8" 18 .6205" .6257"
NPSF-3/8-18-PG-NGO 3/8 - 18 NPSF No Go Thread Plug Gage .375" 3/8" 18 .6205" .6257"
NPSF-3/8-18-PG-D/E 3/8 - 18 NSPF Go/No Go Thread Plug Gage w/handle .375" 3/8" 18 .6205" .6257"
NPSF-1/2-14-PG-GO 1/2 - 14 NPSF Go Thread Plug Gage .500" 1/2" 14 .7700" .7767"
NPSF-1/2-14-PG-NGO 1/2 - 14 NPSF No Go Thread Plug Gage .500" 1/2" 14 .7700" .7767"
NPSF-1/2-14-PG-DE 1/2 - 14 NPSF Go/No Go Thread Plug Gage w/handle .500" 1/2" 14 .7700" .7767"
NPSF-3/4-14-PG-GO 3/4 - 14 NPSF Go Thread Plug Gage .750" 3/4" 14 .9805" .9872"
NPSF-3/4-14-PG-NGO 3/4 - 14 NPSF No Go Thread Plug Gage .750" 3/4" 14 .9805" .9872"
NPSF-3/4-14-PG-D/E 3/4 - 14 NPSF Go/No Go Thread Plug Gage w/handle .750" 3/4" 14 .9805" .9872"
NPSF-1-11 1/2-PG-GO 1 - 11 1/2 NPSF Go Thread Plug Gage 1.0" 1.0" 11 1/2 1.2284" 1.2365"
NPSF-1-11 1/2-PG-NGO 1 - 11 1/2 NPSF No Go Thread Plug Gage 1.0" 1.0" 11 1/2 1.2284" 1.2365"
NPSF-1-11 1/2-PG-DE 1 - 11 1/2 NPSF Go/No Go Thread Plug Gage w/handle 1.0" 1.0" 11 1/2 1.2284" 1.2365"